it opens and displays any animated cursor. AniTuner handles all cursor sizes (not only 32x32) and color depths (from 1bpp to 32bpp). convert animated GIF, AVI clips, bitmap strips BMP and AniTuner Disassembly files ATD into animated cursors (ANI). import image files into frames of static cursors or animated cursors. AniTuner can import bitmap (.bmp), JPEG (.jpg), GIF (static or animated .gif), PNG (24 and 8-bit .png, including alpha channel optionally), Adobe Photoshop® (.PSD - with alpha channel support for 32-bit cursors), cursors (.cur), icons (.ico), animated cursors (.ani) and AVI clips (.avi). 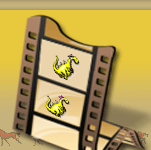 export frames from animated cursors to several image formats. AniTuner can export to bitmap (.bmp), JPEG (.jpg), GIF (.gif), PNG (.png, including alpha channel if 32-bit cursors), Adobe Photoshop® (.PSD - with alpha channel support for 32-bit cursors), Windows cursors (.cur) and icons (.ico). modify existing animated cursors and change their pixel format or dimensions in one click! You can create non-squared animated cursors if you really want it. if you want to use animated cursors on your web pages and blogs, in discussions or emails, in documents, presentations, Flash movies or applications, AniTuner converts them into animated GIF, AVI clips, bitmap strips or even Adobe Flash SWF movies. add, edit, move, copy, paste and remove frames, change their timing; modify them in your own favorite external image editor and then save changes back to the animated cursor in some clicks. reverse order of frames in one click. perform operations and transformations on frames: horizontal and vertical flips, left and right rotations, custom rotations, image merging. add mouse pointers to existing images in some clicks thanks to the image merging feature. AniTuner handles all color reductions and resize operations itself, while taking care of transparency or alpha channels. full support for 32-bit cursors with an 8-bit alpha channel (partial transparency for Windows XP, 2003 Server and Vista). AniTuner can correctly draw 32-bit animated cursors even if your Windows version doesn't support it. turn your old 16 or 256-color animated cursors into 32-bit animated cursors with a semi-transparent shadow. Make XP and vista cursors easily! export and import animated cursors as a series of PNG files (with alpha channel optionally) for easy editing. All relevant information related to the animated cursor is also stored in an AniTuner Disassembly file that you can edit with a text editor. browse for animated cursors on your computer and preview them before opening in AniTuner. create blank animated cursors and add new frames from existing image or cursor files. merge several animated cursors into a single one. AniTuner shows live animated cursors while editing: any change is immediately visible. test animated cursors by replacing the default mouse pointer during a short delay with your edited cursor. edit the title and author of the animated cursor (art information). modify the hotspot of the animated cursor. drag and drop support for animated cursors and frames. AniTuner always optimizes animated cursors when saving them (identical frames will be saved only once). includes a complete context-sensitive help file with screenshots and samples. comes with several sample animated cursors ready to be used and edited. features an easy-to-use interface that lets you visually edit and convert all of your animated cursors. a portable edition is available without any installation required. a real full freeware: no advertising, no "spyware", no restriction nor registration required.
.: Need help about a function? AniTuner comes with a full context-sensitive help file. Just press F1 or click the Help button to display the related help topic.
.: Create XP and Vista cursors! AniTuner can generate 32-bit animated cursors that are recognized by Windows XP and Vista, and they look semi-transparent thanks to the embedded alpha channel.